The village of Serre-les-Puisieux is 11 kilometres north-north-east of Albert. The German front line trenches crossed the Serre Road (D919) just about here in 1916 and entered No Man’s Land about three quarters of a mile south west of Serre. 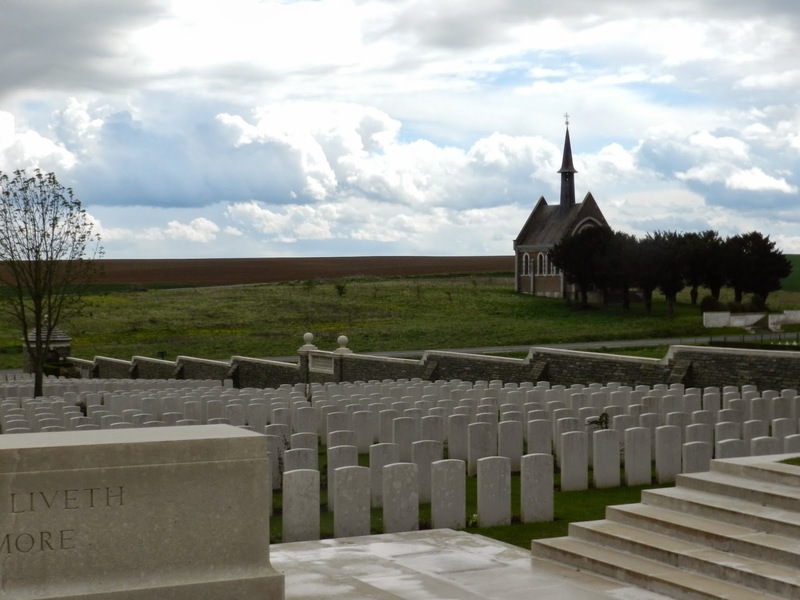 On the first day of the battle of the Somme (1 July 1916), the 31st and 4th Divisions attacked and some parties of the 31st Division did reach Serre, but the attack failed. The 31st Division, with the 3rd Division this time, unsuccessfully attacked again on the 13th November 1916. 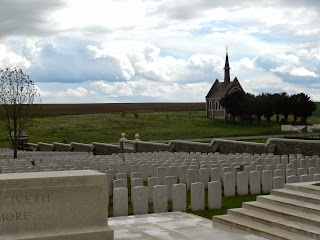 The 22nd Manchesters did manage to occupy Serre on 25 February 1917, but the village was back in German hands in March 1918 until they withdrew in August of that year. Spring 1917 saw the battlefields of the Somme and Ancre cleared by V Corps and new cemeteries were made; three named from the Serre Road. Serre Road Cemetery No.1 was begun in May 1917 and these graves can now be found in Plot I, Rows A to G. Many of the graves in Plot 1 are of identified men, but after the Armistice the cemetery was enlarged, and there are 2,426 burials here - only just under 700 of these are identified. On the back wall are special memorials to twenty-two men who are known or believed to be buried here. There are also special memorials to several men who were buried in other cemeteries, but whose graves were later destroyed in other battles. 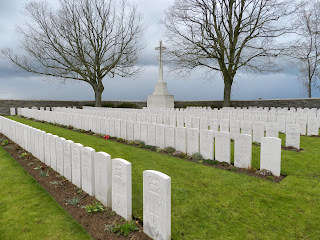 The cemetery is immaculately maintained by the Commonwealth War Graves Commission who do admirable work. 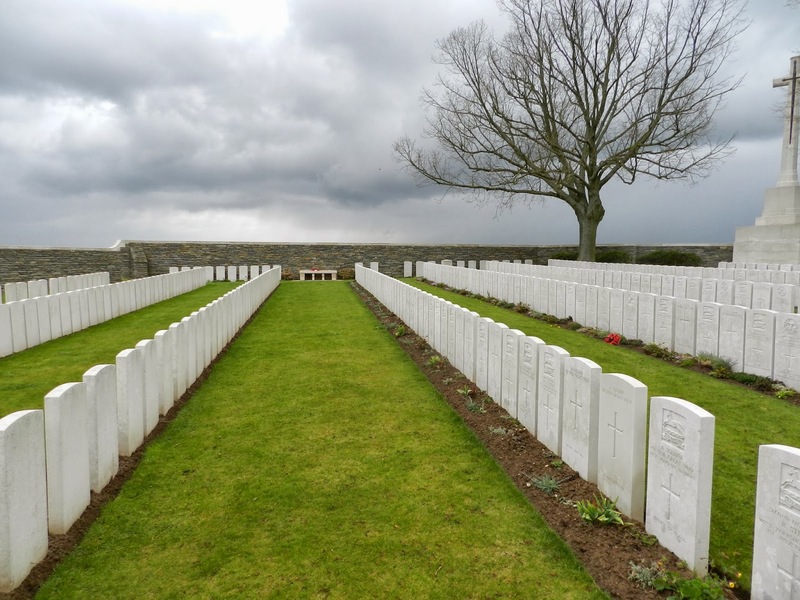 As you climb the slope two brothers are buried together on the right-hand side, Plot 4, row C.
French Canadians, Charles Destrube aged 27 and Paul Destrube aged 26 were both serving with the 22nd Royal Fusiliers, and died together on the 17th of February 1917. Unis dans la mort comme ils l’etaient dans la vie – united in death as they were in life.